When WizKids announced the Pathfinder Battles: Kingmaker series of pre-painted plastic miniatures in April, it offered two huge Elementals as a case incentive pack (see "'Pathfinder Battles: Kingmaker'"). Now the two bonus figures are being solicited separately. 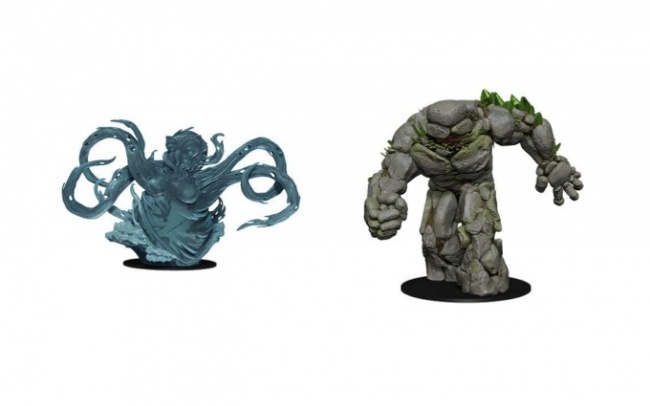 Both the Huge Earth Elemental and Huge Water Elemental are still being offered as incentive purchases only available when a case of Pathfinder Battles: Kingmaker miniatures is purchased. However now, each includes a separate SKU and an MSRP of $34.99 each. Customers who pre-order the case of Pathfinder Battles: Kingmaker Standard Booster Bricks with have the opportunity to purchase both incentive figures. One per case, each. MSRP on the previously listed set was $49.99. Release is planned for October.